Rent a canoe and paddle along the Mersey River in Kejimkujik National Park while taking in the natural beauty of the wilderness that surrounds Nova Scotia. 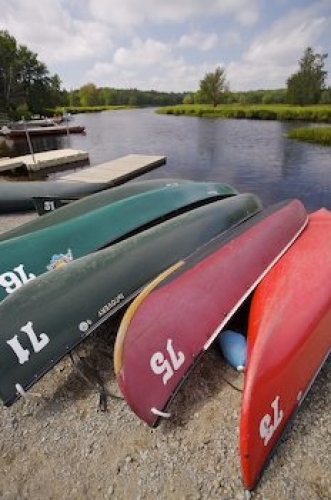 A canoe rental business is located along the banks of the Mersey River with numbers painted on each canoe so that they are easily tracked. Picture of a canoe rental outfit on the shore of the Mersey River in Kejimkujik National Park.